♢ ⧫ ⬠: the fourth kind of Penrose tiling? It’s known that Penrose tilings have several implementations that are mutually locally derivable; but the sources (such as en.wikipedia) list no more than three essentially different variants. There is no difficulty in inventing yet another one by modifying tiles’ shape (and possibly rearranging them), but a “random” set of Penrose tiles will almost certainly contain irregular shapes. A (new) aperiodic tiling with a very regular shape of each tile is no trivial thing. Ī̲ stumbled, by chance, on an aperiodic tiling locally derivable from the Penrose tiling. Its set of tiles consists of three regular shapes: ♢(72° rhombus), ⧫(36° rhombus), and ⬠(the regular pentagon); all having the same side length. With the green curve commonly depicted on Penrose tilings, SVG format. at Wikimedia Commons: More tiles, edges only; Both green and red curves. Surely a set of rules can be formulated to ensure that only aperiodic tilings can be constructed from ♢ ⧫ ⬠. One can notice that ♢ is employed in two distinct rôles; even counting this, we have only four sorts of tiles compared to 6 sorts of tiles (of 4 distinct shapes) from the original (but now almost forgotten) P1. By the way, it seems to me that the ♢ ⧫ ⬠ tiling might be related to P1 closer than to P2 and P3. It it really a new discovery worth publishing ? Should Ī̲ now finish the job by proving, from appropriate rules (see below), local derivability: Penrose tiling ⇐ ♢ ⧫ ⬠? If Ī̲ should, then give me, please, references to terminology and theoretical background that are currently in use by experts. Update July 20: A sequence of simple rules is found that makes ♢ ⧫ ⬠ from a P2. 1. For each long side of a kite shared with another kite, dissect a 36°-72°-72° triangle (taking entire kite’s short side and smaller part of the long side with it) from the kite. After dissecting one triangle a trapezoid remains, and in the case of dissecting two the remnant is a ♢. 2. Unify each pair of these triangles sharing their short side to a ⧫. 3. Dissect each dart to two mirror-symmetric 36°-108°-36° triangles. 4. Unify each half-dart with the shape across its long side. This means, just erase all respective edges. Update July 10: Now Ī̲ try to formalize rules that a ♢ ⧫ ⬠ tiling derivable from Penrose tiling must obey. The conditions listed below are necessary, but Ī̲’m unsure neither about sufficiency nor about minimality. Any ⧫ ⧫ pair may not share an edge. Each ⬠ has two non-joint sides which it may share with other ⬠s only. No other ⬠’s side may be shared with another ⬠. For each ♢ one of its acute vertices is specified as inner and another as outer, with respective distinction for sides. Any ♢’s outer side may be shared with a ⧫ only. Any ♢’s inner side may not be shared with a ⧫. When ♢ ♢ share an edge, their inner vertex must coincide. In other words, ♢ ♢ must join 72°-to-72°, 108°-to-108°, or may not form a parallelogram in their union (72°-to-108°). 5. when ♢ ⧫ share an edge, the ♢’s outer vertex must coincide with a ⧫’s acute (36°) vertex. In other words, ♢ ⧫ must join 72°-to-36°, 108°-to-144°, that is, may not join 72°-to-144°, 108°-to-36°. Ī̲ have other variants for fifth rule, but this one has an advantage to be edge-based (as is customary in tiling theory) and pretty in line with the rule 4. (2) all pentagons (each is cut into an obtuse triangle and a trapezoid by a unique edge). The system of ♢ ⧫ ⬠ prototiles might deserve research for its own merits, but (with derivation rules given) it isn’t very convenient for encoding Penrose tilings. Conditions sufficient for Penrose-equivalence do not formalize as matching rules for it. They can be made a sort of local conditions on blocks of tiles, but these are not rules about edge-sharing of the type “you may connect this side to that side with specified orientation”, nor do restrictions on vertex figures help with it. As for “fourth”, “fifth” etc. set of rules for Penrose tilings, Ī̲ found other (albeit closely related) system of three prototiles much more convenient for derivation of them and serves as a transition from ♢ ⧫ ⬠ to the P3 system, and (by August7) yet another tiling, purely ♢ ⧫ ⬠ but looking differently, where (sufficiently) Penrosean matching rules exist. For details, see the article Ī̲ wrote (but having difficulties to publish it even at arXiv.org due to their endorsement policy; see inside). Not the answer you're looking for? Browse other questions tagged co.combinatorics discrete-geometry fractals tiling or ask your own question. What is the right way to think about / represent general tilings? 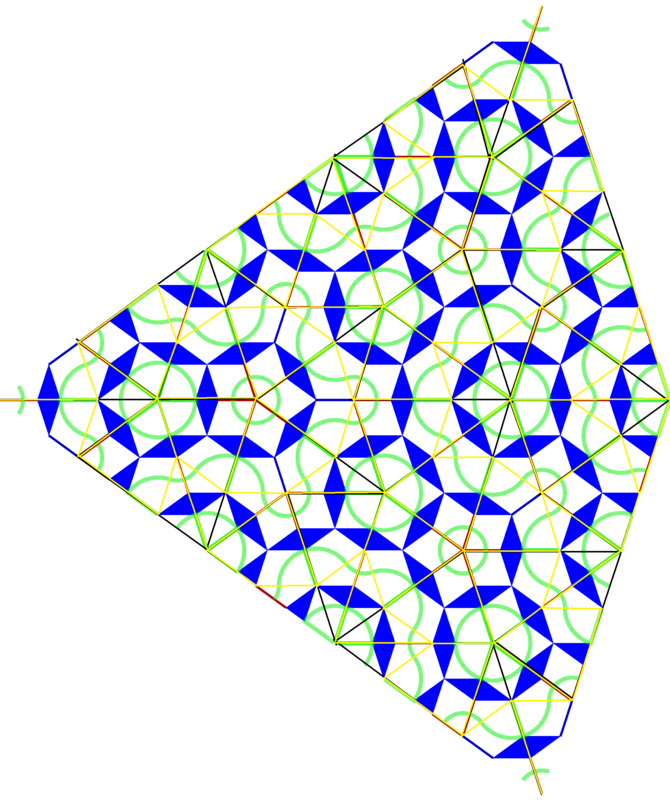 What are Penrose Tilings, and how do they relate to Quasicrystals? 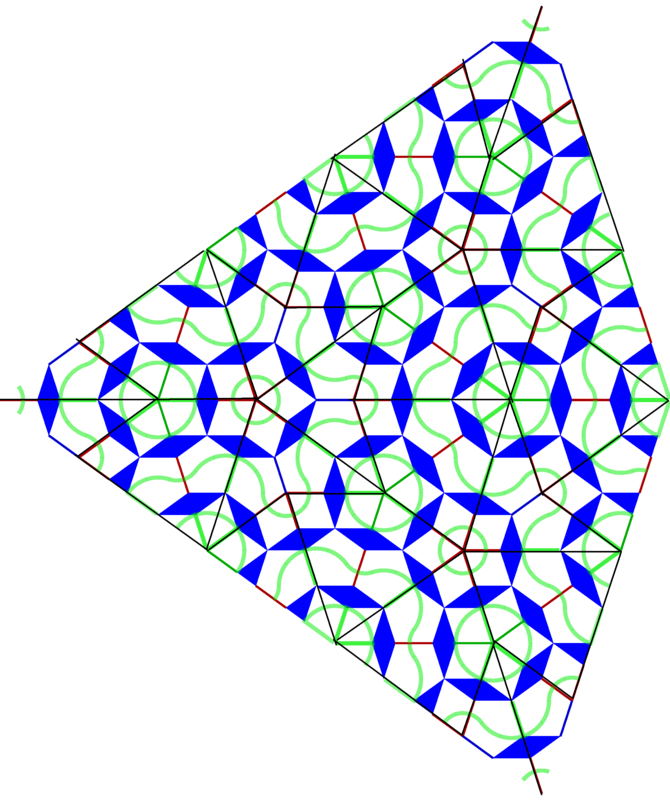 How is the Penrose tiling decapod count of 62 calculated? “Transcendental tilings”: Do they exist?